While we were reviewing the Sony Xperia Z2 we had the Xperia Z1 on hand and decided to test if the two had any differences in image quality. Both Xperias are running the latest Android KitKat software, so the playing field was even. We shot the majority of images in Superior Auto mode at the only available 8MP resolution. We did a single shot in manual mode at the full available resolution. We have a couple of 100%, un-processed crops, followed by the full resolution sources. Looking at the images taken from far away, it seems that both smartphones capture about the same levels of detail. 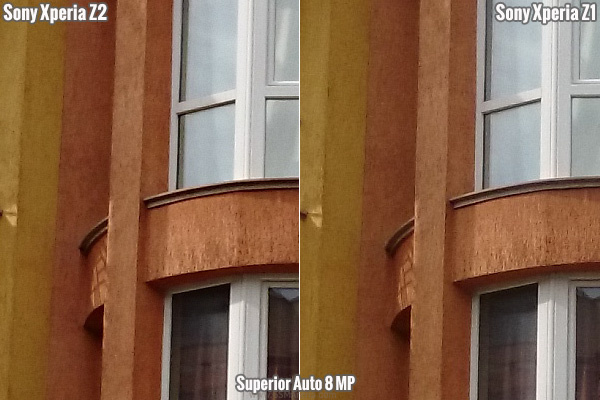 The Xperia Z2 appears to have applied a little extra sharpening but detail-wise the image is the same. Taking a look at a scene shot up close and personal, we see the same effect in action - the same level of detail but a tad sharper post-processing by the Xperia Z2. 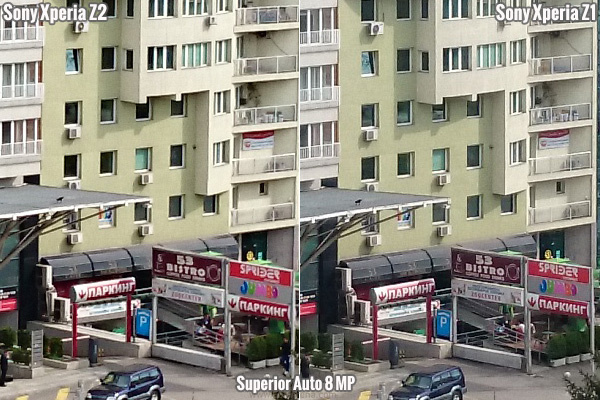 If you want to see the differences for yourselves you can check out these 8 MP Superior Auto samples from both smartphones below. 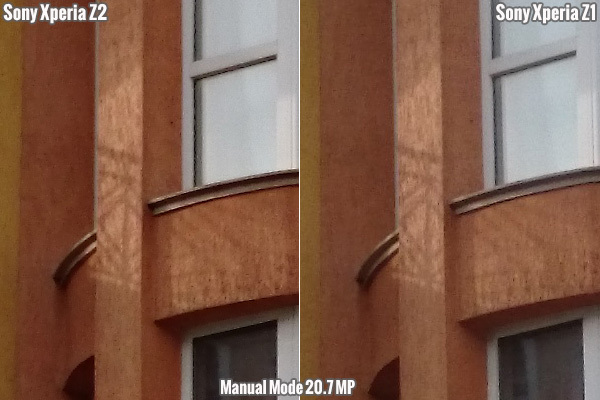 When we look at the 20.7 MP shots, we see a bigger difference - the colors on the Sony Xperia Z2 seem darker, but we can attribute this to a slightly darker exposure setting. The level of detail again seems to be on par, but the Xperia Z2 looks a bit softer in comparison to the Xperia Z1. Here go the full samples from which the crop was made. And finally, we come to low light performance. The results are again consistent with what we just saw in the well-lit samples above. The Sony Xperia Z2 and Z1 resolve almost an identical level of detail, with the Xperia Z2 going a tad sharper. The Xperia Z1 prefers a softer approach. The strength of their respective LED flashes also seems on par. You can check out the full samples we shot below. The first batch is of the Sony Xperia Z2 - shot without and with the flash. 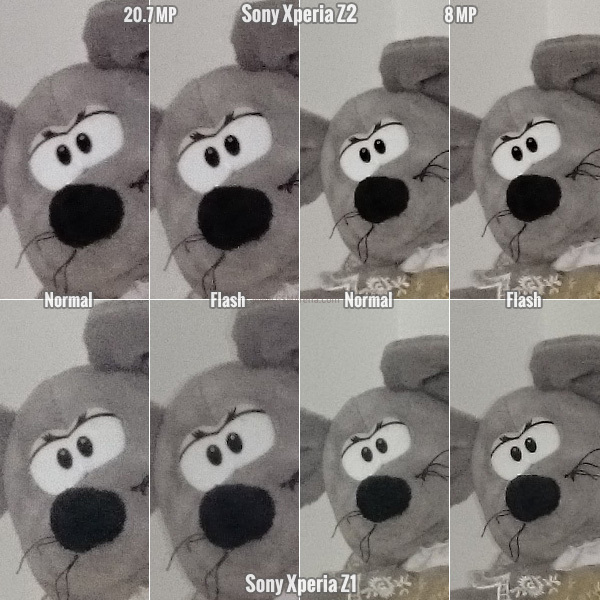 We've divided the samples into 8 MP Superior Auto ones and full 20.7 MP ones. Many were hoping to see a bigger leap in quality between the two generations but that's not the case. For all practical purposes, we would consider the camera outputs of both phones identical. A substantial upgrade over the Z1 can be found in the video camcorder. The new phone puts to good use its newer chipset and now can shoot 4K (or UHD for Ultra High Definition) video. Of course, there are the other shooting modes as well - you can go for 1080p videos at 30 or 60 frames per second (the latter looks way smoother thanks to the doubled framerate) and also HDR video at 30 fps. It captures videos in the pixelicious 3840 x 2160 px resolution (hence the 2160p monicker). That's more than double the linear resolution of a FullHD video. Of course, such a video recording would be best appreciated on a 4K screen. You have a video shutter button in the camera interface or you can go to manual mode and select video as well. That will give you select options for just video. If you want to shoot UHD video there's a shooting mode for it when you press the mode button. The Sony Xperia Z2 outputs 4K video with a bitrate of almost 53 Mbps, which stacks nicely against the 47 Mbps of the Samsung Galaxy Note 3 or the 46 Mbps of the Samsung Galaxy S5. Framerate was a constant 30 fps, while audio was recorded at 150 Kbps bitrate with a sampling rate of 48 kHz and, naturally, stereo channels. FullHD videos at 30 fps carry a bitrate of 17 Mbps - less than half of the UHD mode, but that's expected. Framerate was again a constraint 30 fps, while the audio bitrate was set at 154 Kbps. Smoother 1080p videos at 60 fps have a bitrate of 29 Mbps with almost the same audio bitrate at 153 Kbps. And finally, there is the 1080p HDR video, which has the same bitrate for video and audio as the regular FullHD videos. As is usual for Sony smartphones, the video quality is up there with the best. Detail is more than adequate at 1080p and a lot higher in the 4K video. Videos run smooth and the smartphone picked the right exposure every time. Focus was continuously adjusting in line with the many moving objects in the frame. If you prefer it locked during shooting the video, you can always deselect the Continuous autofocus. The HDR videos weren't all that great in capturing the scene's true high dynamic range. They more or less just look grey throughout the scene and as HDR goes are flatter than regular videos. The Xperia Z2 makes really good videos. If you want a better performing camcorder, your only option would be the Samsung Galaxy Note 3 or Galaxy S5 - they are the only ones that can beat the Xperia Z2 on quality. Here go the full samples uploaded to YouTube. 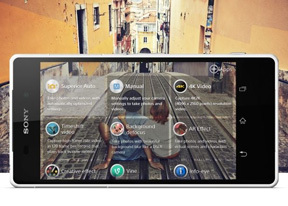 Another video mode you can shoot in is called Timeshift video. It shoots videos in 1280 x 720 resolution at 120 frames per second. It then plays back the video at 30 fps and allows you to choose which part of the video is played back at 120 fps slow motion. It's really nice. Alternatively you can check out our video comparison tool for some extra pixel peeping. It will show you the camcorder capabilities for resolution and detail resolving in both good and low light shooting scenarios and compare them to any of the numerous smartphones in our database. And here are three unedited, unprocessed downloadable samples of 1080p@30fps , 1080p@60fps and 2160p@30fps .